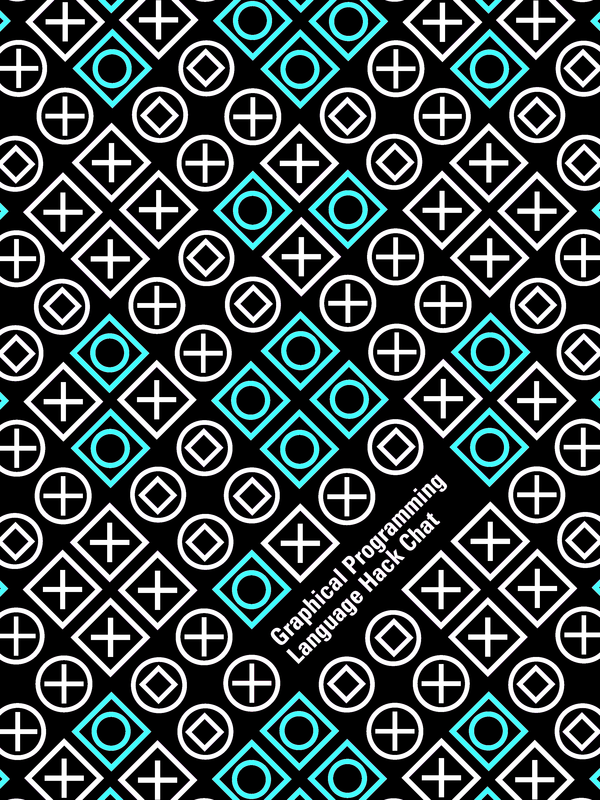 There is a long history of graphical programming languages. Some people don’t like to code, and for them, graphical programming languages replace semicolons and brackets with easy-to-understand boxes and wires. This Friday, we’re going to be talking about graphical programming languages with [Boian Mitov]. He’s a software developer, founder of Mitov Software, and the creator of Visuino, a graphical programming language for the embedded domain. He specialized in video, audio, DSP, DAQ, industrial automation, communications, computer vision, artificial intelligence, as well as parallel and distributed computing. [Boian] is the author of the OpenWire open source technology, the IGDI+ open source library, the VideoLab, SignalLab, AudioLab, PlotLab, InstrumentLab, VisionLab, IntelligenceLab, AnimationLab, LogicLab, CommunicationLab, and ControlLab libraries, OpenWire Studio, Visuino, and author of the “VCL for Visual C++” technology. For this Hack Chat, we’re going to be talking about ways to make programming microcontrollers easier. The focus of this discussion is Visuino, a graphical programming environment. Visuino allows anyone to program an Arduino, Teensy, or an ESP simply by connecting wires and choosing some logic. Think of it as a step above the programming environment that came with the Lego Mindstorms, Scratch, or whatever else MIT was coming out with in the early ‘aughts. Our Hack Chats are live community events on the Hackaday.io Hack Chat group messaging. This week is just like any other, and we’ll be gathering ’round our video terminals at noon, Pacific, on Friday, May 25th. Here’s a clock counting down the time until the Hack Chat starts. Machine is an IDE for building machine learning systems using TensorFlow. You can sign up for the alpha, but first, have a look at the video below to see what it is all about. You’ll see in the video, that you can import data for a model and then do training (in this case, to find a mustache in an image). You’ll see the IDE invites an iterative approach to development since you can alter parameters, run experiments, and see the results. The IDE syncs with “the cloud” so you can work on it from multiple computers and roll back to previous results easily. We don’t know when the IDE will leave alpha status (or beta, for that matter), but the team’s goal is to release a free version of Machine to encourage widespread adoption. If you want to learn more about TensorFlow, you are in the right place. We’ve also covered a bare-bones project if you’d rather get started that way. You can also find some good background material going all the way back to the early perceptron-based neural networks. We don’t use a GUI IDE, but if we did, it would most certainly be something along the lines of [Martin]’s embedded-IDE project. We’ve always felt that most IDEs are just fancy wrappers around all the tools that we use anyway: Makefiles, diff, git, ctags, and an editor. [Martin]’s project makes them less fancy, more transparent, and more customizable, while retaining the functionality. That’s the hacker’s way — putting together proven standard tools that already work. The code editor he uses is QScintilla, which uses clang for code completion. The “template” system for new projects? He uses diff and patch to import and export project templates. Because it uses standard tools all along the way, you can install the entire toolchain with sudo apt-get install clang diffutils patch ctags make on an Ubuntu-like system. Whatever compiler you want to use is supported, naturally. We can’t see a debugger interface, so maybe that’s something for the future? Anyway, if you want a minimalistic IDE, or one that exposes the inner workings of what it’s doing rather than hiding them, then give [Martin]’s IDE a try. If you want more bells and whistles that you’re not going to use anyway, and don’t mind a little bloat and obscuration, many of our writers swear by Eclipse, both for Arduino and for ARM platforms. We’ll stick to our butterflies. Ask Hackaday: How Do You Python? Python is the Arduino of software projects. It has a critical mass of libraries for anything from facial recognition and neural networks to robotics and remote sensing. And just like Arduino, I have yet to find the killer IDE for Python. Perhaps I just haven’t tried the right one yet, but it could be that I’m just doing Python wrong. I’m a Linux-only type of a guy so using IDLE for Python is a natural fit. It’s in the repositories for super quick and easy install and there’s basically zero configuration to be done. Generally speaking my preferred development environment is text editor and command line compiler. IDLE is just one step above that. 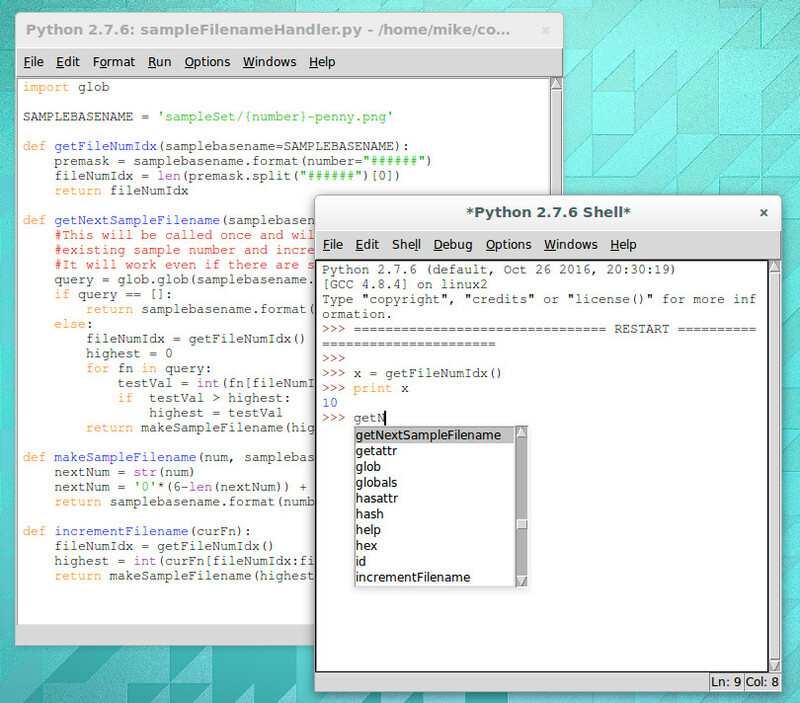 You get a separate window for the shell and each Python file you’re working on. Have IDLE run your code and it saves the file, then launches it in the shell window. For me, there are two important features of IDLE’s shell. The first is that it keeps an interactive session open after you run your Python code. This means that any globals that your script uses are still available, and that you can experiment with your code by calling functions (and classes, etc) in real time. The second desirable feature is that while using this interactive shell, IDLE supports code completion and docstring support (it gives you hints for what parameters a function accepts/requires). But simplicity has a tough time scaling. I’m working on larger and larger projects spread over many files and the individual nature of IDLE editor windows and lack of robust navigation has me looking to move forward. 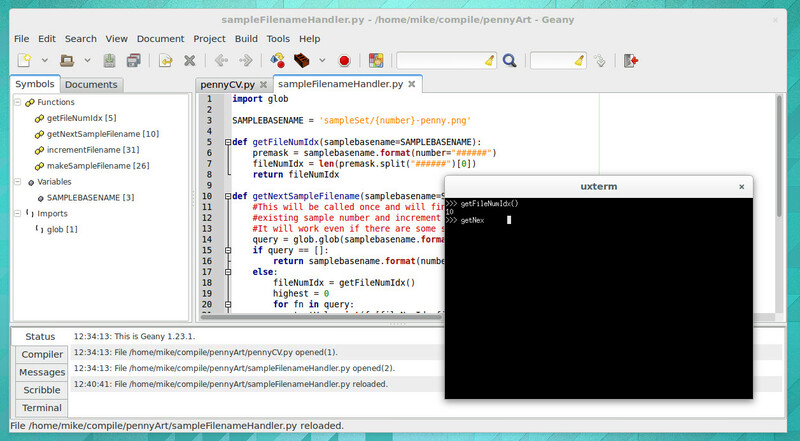 I’ve tried perhaps a half-dozen different Python IDEs now, spending the most time on two of them: Geany and Atom. Both are easy to install on Linux and provide the more advanced features I want for larger projects: better navigation, cross-file code completion (and warnings), variable type and scope indication. The look of Geany brings to mind an “IDE 1.0” layout style and theme. It’s the familiar three-pane layout that places symbols to the left, code to the right, and status along the bottom. When you run your program it launches in an interactive terminal, which I like, but you lose all IDE features at this point, which I despise. There is no code completion, and no syntax highlighting. I have been using Atom much more than Geany and have grown to like it enough to stick with it for now. 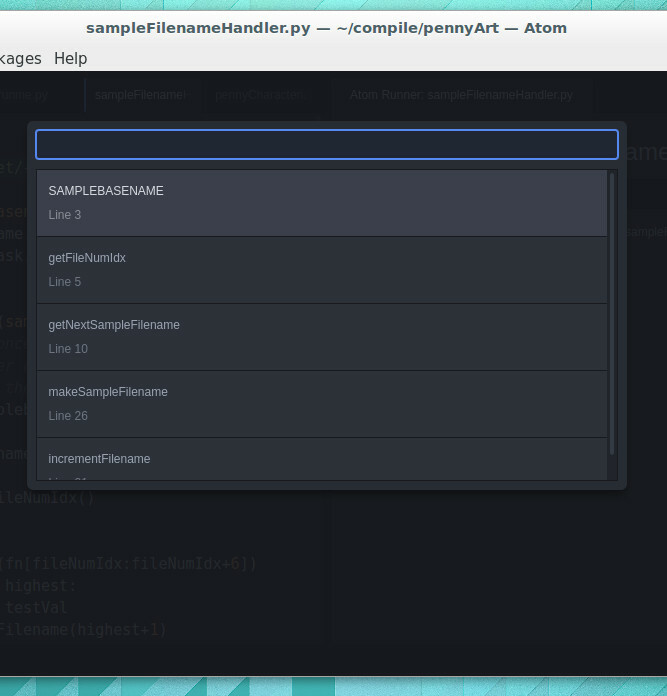 I’d call Atom the “IDE 2.0” layout. It launches with a dark theme and everything is a tab. Atom depends heavily on packages (plugins that anyone may write). The package management is good, and the packages I’ve tried have been superb. I’m using autocomplete-python and tabs-to-spaces, but again I come up short when it comes to running Python files. 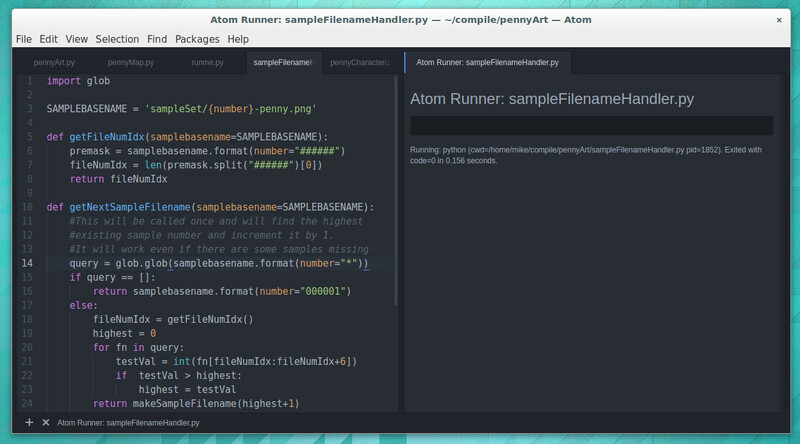 I’ve tried platformio-ide-terminal, script, and runner plugins. The first brings up a terminal as a bottom pane but doesn’t automatically run the file in that terminal. Script also uses a bottom pane but I can’t get it to run interactively. I’m currently using runner which has an okay display but is not interactive. I’ve resorted to using a “fake” python file in my projects as a workaround for commands and tests I would normally run in the interactive shell. It’s entirely possible I’ve just been using Python wrong all these years and that tinkering with your code in an interactive shell is a poor choose of development processes. What do you prefer for your Python development? Does an interactive shell matter to you? Did you start with IDLE and move to a more mature IDE. Which IDE did you end up with and what kind of compromises did you make during that change. Let us know in the comments below.